When you are remodeling your home, dust is a highly unwanted part of life. Demolition debris dust, sawdust, and worst of all, drywall dust, travel throughout the house, well beyond the work area. The typical solution is to tape sheet plastic against the ceiling, walls, and floor with masking tape. But since masking tape cannot hold the weight, the screen usually falls down fairly quickly. Another solution is to staple the plastic to the walls and ceiling. To keep the staples from tearing through the plastic, it is necessary to bunch up the plastic or fashion a hem of masking tape along the edges of the plastic before stapling it to the walls and ceiling. Not only is this cumbersome, but unnecessary holes are added to the walls and ceiling. A portable system called ZipWall Dust Barrier System promises to eliminate that old method altogether, providing effective dust control and with no damage to your home. How does ZipWall work and is it worth purchasing? ZipWall Dust Barrier System helps you build a sheet plastic dust containment wall and it ensures that the wall stays up. Telescoping stainless steel poles with spring-loaded tips form the vertical braces of this temporary wall and hold the plastic tight against the ceiling and the floor. Optional foam-padded rails attach to the top ends of the pole to form a "T" along the ceiling, sealing off any possible penetration point for the dust to infiltrate your house. Optional clamps hold the vertical edges of the wall firmly against the walls of your home. While not specified by the instructions, ZipWall can be used for projects other than for dust containment. ZipWall's stainless steel poles are sturdy enough that they can press a full sheet of drywall against a ceiling. Or the ZipWall poles can press crown molding into place, freeing your hands for the hammer or nail gun. ZipWall works well and it works for a long time. The materials are high-quality and well-designed. For a small space, it is possible to get by with just two poles, one at each end, minimum. A third pole at the center would help improve stability and prevent the plastic sheeting from blowing around. 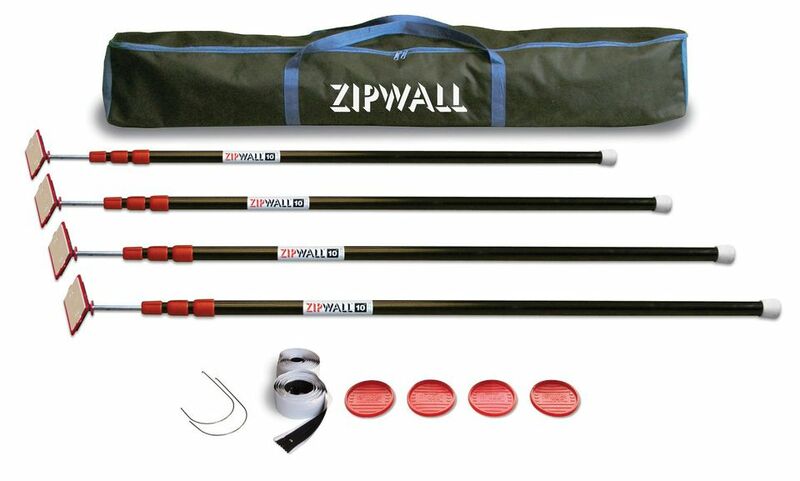 ZipWall does not provide a 100-percent airtight seal, not is this its intended purpose. As with any plastic sheeting dust containment, there will always be a small gap at the top where the sheeting is sags. If you are on a budget, you may want to begin with a couple of poles to familiarize yourself with the system. Rather than buying ZipWall's special side clamps, it's possible to improvise by tucking the sheet plastic between the pole and the wall. Along the ceiling, you can pull the plastic taut between the poles rather than buying the optional foam rails. Though not perfect, it will be far better than the staple-and-tape method. ZipWall may eventually break down. The review model lasted for about ten years before one of the pole's inner mechanisms stopped working. The other pole, though, continues to work well. As a matter of disclosure, the ZipWall review model was used for projects that went beyond its intended purpose of holding up sheet plastic. One of the best things about ZipWall is that it allows you to keep your feet on the ground when placing the plastic against the ceiling. The foam pad at the end of the pole is sticky enough that it can grab an edge of the plastic. You can hoist the pole aloft, press the plastic against the ceiling, then force the bottom of the pole onto the floor. The rubber tips at the bottom of the poles allow you to kick the pole into place, without fear of scratching the floor. ZipWall Dust Barrier System is wholeheartedly recommended. However, if you are not intent on doing much home improvement, the ZipWall Dust Barrier System is probably not for you. Make do with the tape-and-staple method with the sheet plastic. ZipWall is designed more for serious do-it-yourselfers who want to do a considerable amount of work on their homes: drywall, demolition, painting, and floor sanding. Even if you are on a budget but anticipate a lot of renovation activity, you may want to buy the whole system: poles, clamps, and rails. Any type of contractor or person in the trades should purchase the ZipWall Dust Barrier System since clients expect to find a clean and dust-free home after the work is done. How Effective is Soundproof Drywall?